Subscribe to the FREE "Chair Massage Business" Newsletter by entering your name and email address below and we'll give you access to lots of great information to keep you up to date in the world of chair massage. "Thank you very much for being so generous to us, for tips and additional ideas you have given to us. Every newsletter you send us is a very big help to us on how we can continued in this business and how to improve our services." You'll find extensive chair massage reviews of portable massage chairs for massage therapists. You'll find out where to get training or chair massage certification and how to pick the best chair massage schools or workshops. If you prefer learning massage on your own, we'll review chair massage videos and books as they become available. We'll even teach you some great chair massage techniques that not only feel good, but that are stress free on your body. If you are interested in seated massage as a business, you'll find out about the range of possibilities for doing on-site massage and great chair massage marketing tips for setting up corporate chair massage jobs, whether that's corporate on site massage, event massage or massage in retail environments. You'll find lots of other goodies including chair massage research and media articles. You'll get the newsletter on a monthly basis so that you're always be kept up to date on the latest happenings in this exciting industry. Your email will never be sold or shared and if you do not love the newsletter, you can unsubscribe by clicking on the unsubscribe link at the bottom of each and every newsletter. Here we'll examine massage therapy employment and job options in the industry. We will look at what qualities people are looking for in subcontractors. We'll profile successful chair massage professionals so you can discover exactly how they do it. Learning how to massage in massage chairs can be difficult if you've been trained in classical or Swedish massage. Give a massage in the most efficient way by following our massage tips. Find out where to get the best chair massage training, whether you are just starting your chair massage or a massage therapist with years of training looking for continuing education credits. You'll find massage therapist schools and other organizations that offer workshops, classes, and chair massage certification. We'll review a small but growing number of chair massage videos and chair massage books that are finding their way out onto the shelves. The good, the bad, and the ugly. You'll find them all here. Chair Massage Research ? ?There are a small number of research studies available specifically on the effects and benefits of chair massage. You'll be able to look through the abstracts here. The media loves massage and you'll find numerous chair massage articles here. 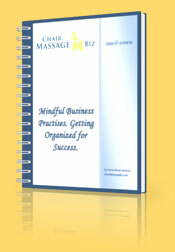 Subscribe to the Free Chair Massage Business newsletter and we'll notify you as these resources become available. Click here and let us know what topics you'd like covered in up and coming newsletters. © 2019 ChairMassageBiz.com - All rights reserved.